Our all-inclusive offices make running your business easier than ever. Unlike traditional office space that you must manage, you simply pay a flat monthly rate and leave the office management to us! Our office solutions require little to no capital investment on your part, making our offices an excellent choice for start-ups and small businesses with limited funds. Realistically, most businesses do not utilize all of their space or services daily, but in traditional office space, they must still be paid for monthly regardless of use. With executive suites the cost of services, conference rooms, break rooms, and more are spread among multiple tenants, meaning the monthly cost for each company is significantly lower than it would be if paid individually in conventional office space. Flexible leasing solutions are perfect for businesses of all sizes. Whether you are a small business looking for affordable office space or a large corporation that simply needs to house employees convenient to your customers within Washington, DC, AdvantEdge Business Centers can provide an office solution for you. If you are a growing business or have future growth plans, flexible leasing terms provide a significant advantage over traditional office space. Our leases allow you to add more space as necessary with a simple lease amendment. When leasing conventional office space, if you outgrow your space, you will simply have to pay for two offices or operate in an office space that is insufficient for your business. 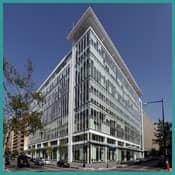 If you would like to learn more about the advantages of leasing office space in Washington, DC from AdvantEdge Business Centers, contact us today to schedule a free tour of our facilities.